If you are anything like me, you love the smell of freshly laundered clothes. I like my clothes to look, feel, and smell clean. I also like my laundry room to smell nice after a wash. So, I am always on the lookout for a laundry detergent which cleans well, removes all stains, is gentle on my clothes, and also smells great; all at the same time. Sounds like a difficult combination but here is a list of the 10 best smelling and cleaning laundry detergents that make laundry task seem more pleasant. How To Choose The Best Smelling Laundry Detergent Suits You? Cons: Cumbersome to store; easy to spill and clumps in damp places. Liquid: In the form of thick, viscous liquid. 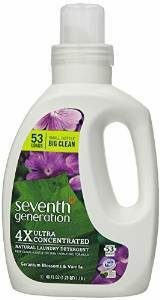 Seventh Generation Liquid Laundry, Ecover Liquid Laundry Wash, Method 8x Concentrated Laundry Detergent, Mrs. Meyer’s Clean Day Liquid Laundry Detergent and Arm and Hammer detergents are examples of this. Cons: can spill and be messy. Cons: expensive and small children can mistake them for candy. Also look at the type of washing machine you have. If you have an HE machine, you will need to buy an HE laundry detergent. Look at factors like what is the ratio of surfactants (they remove the dirt from the clothes) and enzymes (remove stains) and bleaching agents in the detergent. 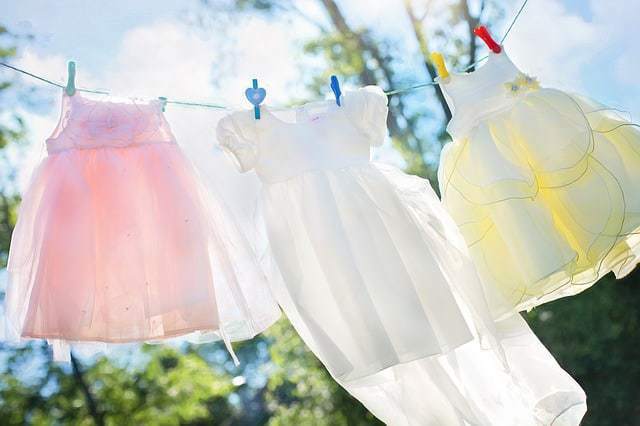 Consider other factors like optical brighteners, fabric softeners and increasingly lately organic formulations which can add value to your laundry process. Also, it is important that the clothes come out smelling fresh and nice, so look at buying one whose fragrance agrees with you and your family’s olfactory senses. Finally look at reviews online, speak to your family and friends and select that laundry detergent which right for your pocket and your family needs. Gain is manufactured by P&G. 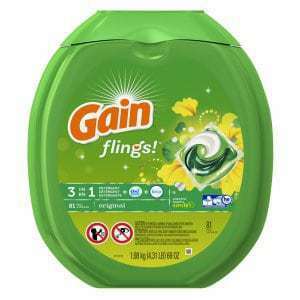 This version of gain is a 3-in-1 product with concentrated Gain liquid detergent, Oxi-boost for stain removal and Febreeze which fights odors all packed into each pod. It is easy to use – just drop the pod ( the number will depend on the size of your laundry) into the washing machine along with your laundry and then start the machine. It is very convenient as there are no spills and no mess. They can be used with both standard machines and HE machines. Gain is priced to be a mid-level detergent and has surfactants like linear alkylbenzene sulfonates etc. to remove surface dirt and amylase based enzymes which act as stain removers. It has 50% more Gain smell ingredients as compared to the liquid detergent it is as the advertising says “music to your nose”. The smell hits you as soon as you open the packet. It is a wonderful clean fresh smell. 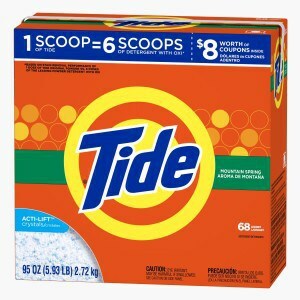 Tide is the no1 selling laundry brand in America. The Tide Ultra is a concentrated formula in a powder form. You need to use about one-third the quantity of tide as compared to other laundry detergents. So you need a lesser quantity of detergent for the month. Use the included scoop to the appropriate mark for best results. Tide has always been a leader in stain removal among laundry detergents. It is made of bio-degradable surfactants (which remove surface dirt and mud) and enzymes (for stain removal) and so is environmentally friendly. This version is not meant for HE machines. It is also slightly more expensive, but it is worth the money spent. Your clothes have a sweet smell of mountain spring after being washed with this detergent. It is a mild smell which smells of citrus and green floral which reminds you of smells of a mountain on a summer day which we simply love. 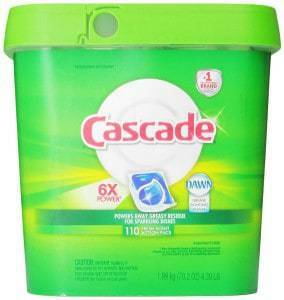 Cascade Actionpacs is part of the Cascade family of dishwashing detergents which are one of the bestselling brands in the USA. These are in the form of single-dose packets of concentrated liquid which has 4 times the power of a liquid or a powder detergent. It also has the grease fighting power of Dawn. The ingredients include rinse aid and water softeners so that no hard water deposits are left on glass articles being washed. It has been specially formulated for HE dishwashers. It is easy to use – just pop one pack in the dispenser and run the machine. It comes in a re-sealable bag which makes it convenient to store and use. 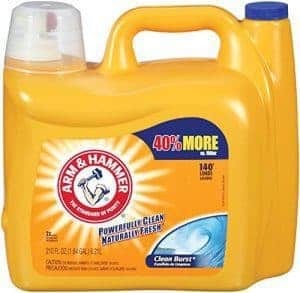 One of the oldest laundry detergent brands in the US, this is the Arm & Hammer liquid laundry detergent with a clean burst smell. It is a concentrated formula, which requires much less detergent per laundry load. This liquid detergent has the power of ARM & HAMMER™ Baking Soda which leaves your clothes clean and smelling fresh. Its low-sudsing formula is designed to work well with standard machines and HE machines. It has ingredients which help in trapping the dirt in wash-water so that they don’t deposit back on to the clothes when the washing machine drains. It has a unique bottle with 2 caps, a clear one for measuring the liquid detergent and a blue one with holes in it to let air in so that no vacuum is created when the liquid is poured out. The smell is the traditional Arm & Hammer smell which is clean and fresh with no added fragrances. 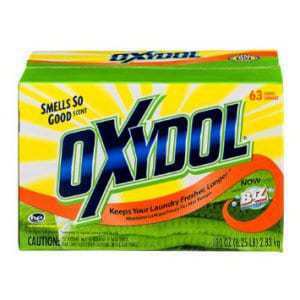 Oxydol is the oldest commercial laundry detergent from Proctor and Gamble. It is now manufactured and marketed by CR Brands which acquired it from P&G. It contains bio-degradable surfactants (both anionic and non-ionic) to remove the surface dirt, enzymes which comes from the biz (used to be pre-soak stain remover) and a mild fragrance. It contains no harmful chemical like chlorine bleach and phosphates. It is meant for a budget conscious customer who wants a good quality laundry detergent and stain remover. It is compatible with standard washing machines and HE washing machines. You can use it to pre-treat stubborn stains. We also like the fact that the container in which Oxidol comes is recyclable, so it is environmentally safe. Biz also acts as an odor neutralizer which removes strong smells from your clothes. The laundry detergent has a very mild fragrance which leaves the laundered clothes smelling fresh and clean. 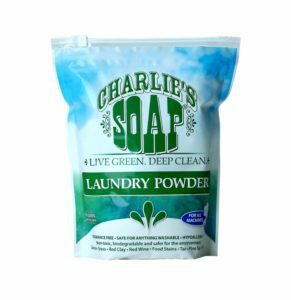 The Charlie’s Soap “Laundry Powder” is made of bio-degradable ingredients like washing soda, detergents made out of coconut oil and a drying agent. The Charlie’s soap is manufactured by a family-owned firm based out of North Carolina. It rinses out without leaving any residue on the clothes. This also means that this detergent is safe for babies and people with sensitive skin. It is safe for use in a HE machines. We also love the fact that the container is made of 100% post-consumer recycled material. Sometimes when you open a new jar, you can get a fishy smell. This evaporates in a few minutes. There is nothing wrong with the jar; it is just a by-product of using bio-degradable components. This laundry detergent contains no added fragrance as its ad says – “nothing but the good old-fashioned smell of clean. If you want flowers, go pick some”. Washing with this detergent leaves your clothes smelling clean and fresh. Mrs. Meyers has a simple philosophy “keeping things clean is easy, you just need the right soap”. Mrs. Meyer’s Clean Day Liquid Laundry Detergent is in keeping with this philosophy. 97% of its ingredients including surfactants and enzymes are derived from natural sources mostly plant extracts. The small “non-compliance” is for 2 synthetic-preservatives which help increase the shelf life. It does not contain any ammonia, chlorine-bleach or phosphates. It has a concentrated formula which means you use only 1 tablespoon for every standard load. It is a strong cleaner but is gentle on clothes and safe on hands. It is HE machine friendly. Its fragrances are mostly a mixture of natural, high-quality essential oils mixed with a few synthetic items to stabilize the fragrance. 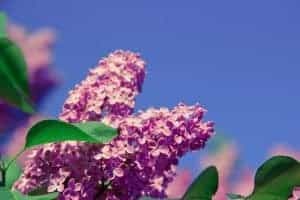 The laundry detergent comes in various fragrances including Basil, Lavender, Sunflower, Lemon Verbena, Rosemary, and Bluebell. My personal favorite is Lavender which is mild and leaves the clothes smelling like outdoors. 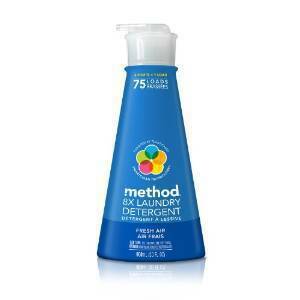 Method is an 8X concentrated formula liquid laundry detergent which is phosphate-free and bio-degradable. It has 95% natural, plant-based and renewable ingredients which deliver a concentrated detergent, of which you need to use only ¼ quantities of other liquid detergents. This was due to its patent-pending Smartclean Technology. We like the fact that the bottle are made of 50% post-consumer recycled plastic. We also like the fact that it has never been tested on animals. It also uses green technology to manufacture using almost 30% less energy and water as compared to other leading detergent brands. Even the preservatives used are bio-degradable. It has a convenient pump which dispenses the amount required for a standard load (you need just one hand). The Method 8X comes in three fragrance choices, fresh air, lavender cedar and no fragrance. We loved the fresh air version because it smells like fresh air wafting through a room. 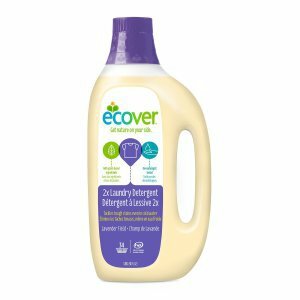 The Ecover Liquid Laundry Wash is made of mostly plant-based ingredients including detergents made of non-GMO rapeseed oil, sugar detergents, etc. The Ecover Liquid is a naturally low foaming detergent without any added silicones. It is proven to be 10 times less toxic for aquatic organisms than your standard laundry detergent. The company is also against animal testing of its products. It has no phosphates or optical brighteners which makes it more environmentally safe. Despite all this, the Ecover Liquid detergent delivers exceptional washing results even in cold water. It leaves no residue on the clothes which leave the clothes clean, fresh and soft. This also increases the life of the clothes. It is also safe for babies and sensitive skin. The bottle also is made of plant plastic which is fully recyclable and renewable. It has no artificial fragrances and leaves the clothes smelling clean and fresh. 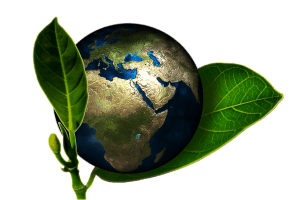 The Seventh Generation is a major brand in the emerging sector of organic or green detergents that have ingredients – both surfactants and enzymes which are derived from plants or natural mineral based products. 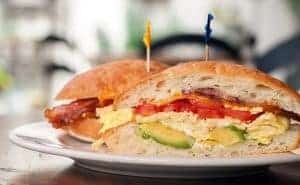 It has been USDA certified to be 96% Biobased. It is non-toxic. It is hypoallergic which means it can be used for clothes used for babies and people with sensitive skin. It uses no optical brighteners, dyes or synthetic fragrances. It is a strong laundry detergent which cleans clothes and is tough on stains. It is made of twenty-eight ingredients out of which only 2 are synthetic (only preservatives). 16 of these ingredients are essential oils and botanical extracts like Beta-caryophyllene, cananga odorata (ylang ylang) flower oil, cedrol, citronellol, citrus aurantium bergamia (bergamot) fruit oil etc. which are the ones which give this version of the detergent the beautiful light smell. This detergent is also available in scents like citrus, Blue Eucalyptus & Lavender and also has a version which is fragrance-free. answers.yahoo.com : What is the best smelling laundry detergent/fabric softener combo? essentialbaby.com.au : is the nicest smelling laundry detergent? netmums.com : Best smelling laundry detergent? ?